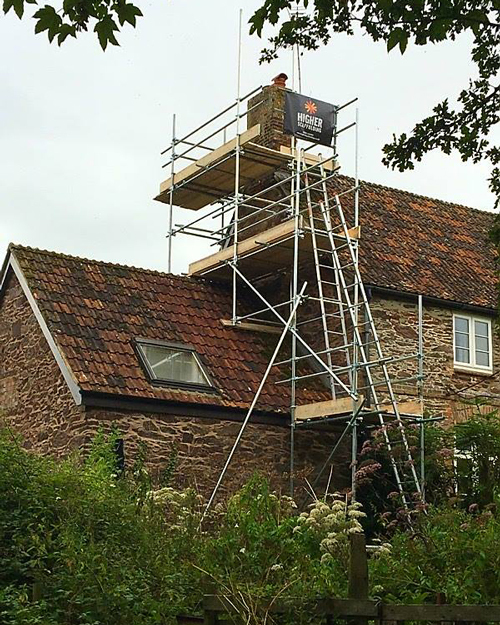 Higher Scaffolding provides experienced scaffolding services to both commercial and domestic contracts. 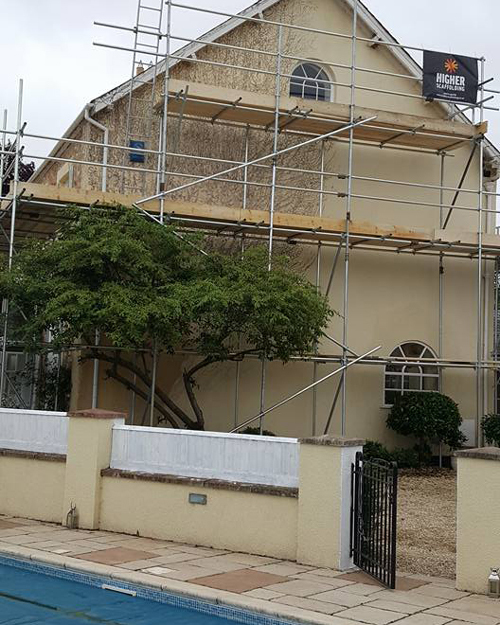 We aim to be the leading supplier of scaffolding products and services to Taunton and surrounding Somerset and Devon. All scaffolding employees have attended Health & Safety training schemes and have achieved appropriate qualifications to meet our high health and safety standards. 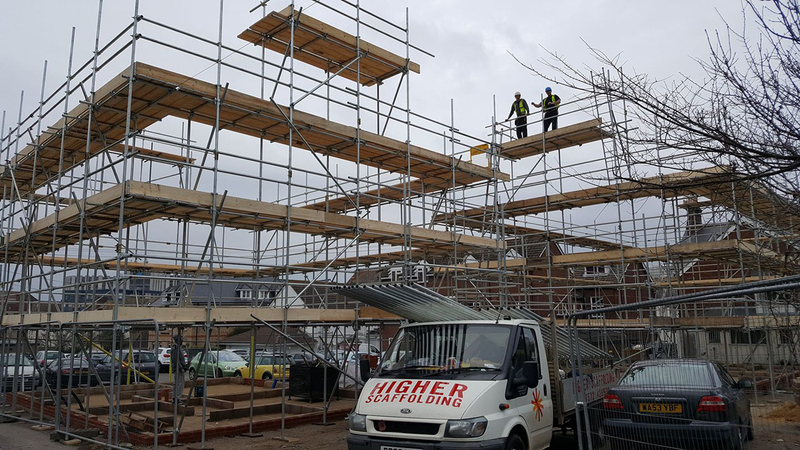 Higher Scaffolding‘s reliability and focus quoted lead times make us the scaffolding suppliers that you can depend on with a personal service. 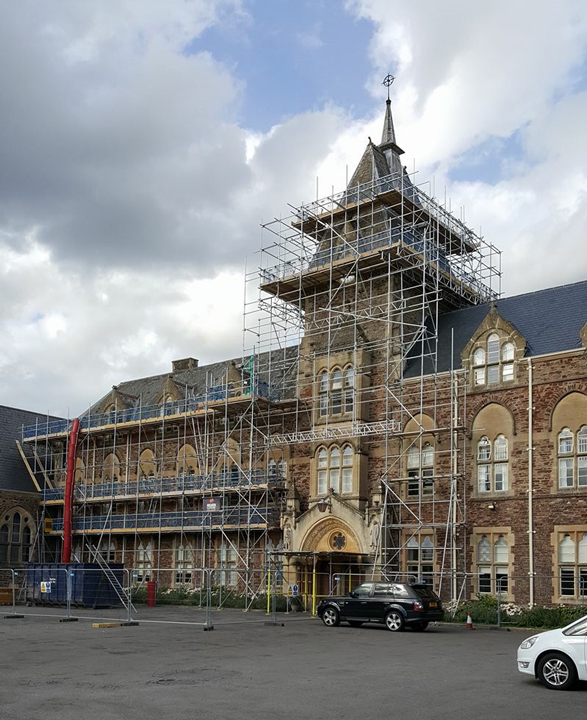 We would be pleased to arrange a site survey to discuss your needs and advise on the safest and most cost effective way of constructing the scaffold access that you require. Our areas of work cover all of Somerset – Wellington, Chard, Taunton, Bridgwater, Cannington, Highbridge, Street, Yeovil, Ilminster. We also cover many areas in Devon – Tiverton, Hemyock, Honiton, Ottery St Mary, Cullompton, Exeter, Exmouth. Please call us on 07572 426900 or use the contact form below. Quotations are open door acceptance within three months from the date of receipt of the quotation by the clients. It shall be the responsibility of the client to notify Higher Scaffolding when the scaffolding is ready to be dismantled. If said notification is not received, the scaffold will go into extra hire, being 6 weeks, and will be chargeable at 10% contract value per week. The scaffold will remain on hire until such time. The scaffold is to be used for the purpose described and must not be overloaded or the number of lifts exceeded. The client shall use the scaffolding at their own risk in all respects and shall indemnify Higher Scaffolding against all claims, damages and costs arising out of the scaffolding except that where such claims, damages and cost are due to negligence of the Higher Scaffolding. The latter shall be responsible for and indemnify the client against such claims, damages and costs; provided that it shall be a condition precedent to Higher Scaffolding bearing responsibility therefore that the client gives forthwith to Higher Scaffolding written notice specifying the said damage.The client shall also be responsible to Higher Scaffolding operatives and/or any persons involved for damages arising due to the client or his employees interfering with any structure or boards positioned/fixed by the owners. The client should remove satellite dishes from buildings before we commence erection of the scaffold. It is your responsibility to replace it afterwards. If you do not remove it, we cannot accept responsibility for any damage. The client is responsible for obtaining all necessary Party Wall Agreements to allow us to erect off and over the relevant adjoining property or properties. None of our material are fire retardant, unless specifically stated in the quotation. 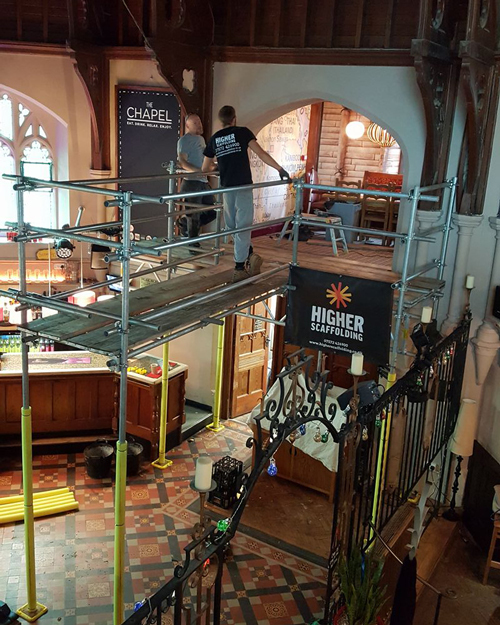 The client is to ensure that we are provided with a firm and level base for our scaffold that will not settle under the self-weight, plus the design loads imposed. The base is to extend at least 300mm outside the scaffold. If timbers are larger than 2″, scaffold boards are required, these are provided by the hirers. Suitable access is required for delivery of services, enabling the materials to be off loaded and reloaded within 10 meters of the scaffold site. Additional charge may be made if greater distance is involved. 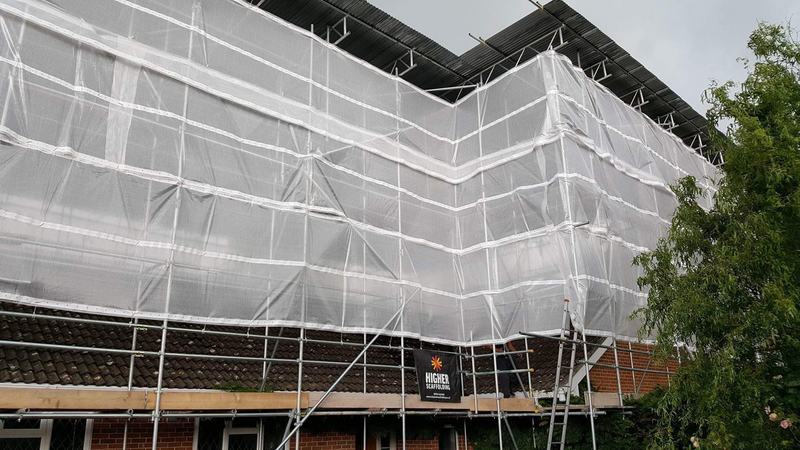 The client will ensure the security of the scaffold at all times, preventing unauthorised access. The clients shall ensure that all the scaffolding is swept clear of any debris, building rubbish or building equipment etc. prior to dismantling. The client will ensure that the roof safely supports the weight of the scaffold structure plus the design imposed load. We regretfully cannot accept responsibility for damage caused by or arising from working off fragile roofs, although every possible care will be taken. The client is fully reasonable for the protection of the roof and therefore any damage. The hire period if stated in the quotation denotes the minimum length of the contract. There will be no refund for any remaining period. All payment is to be received on completion day of scaffold erection, unless otherwise stated and agreed with Higher Scaffolding. We reserve the right to charge interest, at the current rate on overdue accounts. Should you wish to cancel within 48 hours of work commencing, there will be a call-out charge of minimum £150. This will vary according to distance travelled and size of job preparation. After erection of scaffolding, or any alterations that have been completed by Higher Scaffolding, it will be the responsibility of the client to carry out periodic inspections required by the building regulations and to ensure that the scaffolding is used in accordance with, and continues to comply with ‘The Construction (Design & Management) Regulations 2015. Higher Scaffolding can organise weekly scaffold inspections at an additional fee of £150 per visit per inspection. Weekly inspection charges may increase by the size of the project. 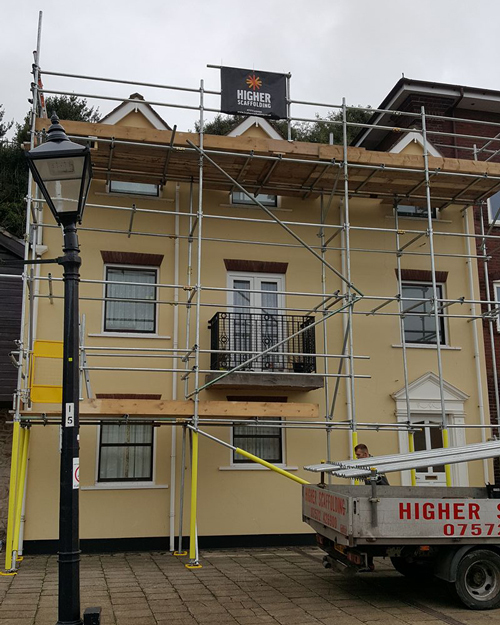 The acceptance of the quote and proceeding with scaffolding erection, the client accepts all the terms listed above and agrees to abide by these terms.